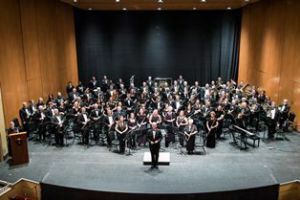 The Pensacola Civic Band will present “Heal Our Land,” a concert event celebrating unity through music, at 7:30 p.m. Saturday, April 14, at the Pensacola Saenger Theatre, 118 S. Palafox St. The musical showcase will feature special guest artist Brian Shaw on trumpet, a reading by community educator Robin Reshard, and performances by the Heal Our Land Community Choir. Selections will pay tribute to historical events and honor the strength of the human spirit. The program is sponsored, in part, by Pensacola State College. Tickets are $10 and can be purchased at the Saenger Theatre box office, online at www.ticketmaster.com or Pensacola State’s Lyceum Box Office from 8:30 a.m.-4 p.m. Monday through Friday. The Lyceum box office is in Ashmore Auditorium, 1000 College Blvd., Building 8, Room 861. For more information, call the Saenger Theatre at (850) 595-3880 or the Lyceum at (850) 484-1847.